Honda seems to have its hands full as far as showcasing the product line for India goes. Soon the City will have a global debut in India followed by the new Jazz and Mobilio MPV sometime next year. While thousands of miles away, in Tokyo we are seeing yet another model that's closely related to the Honda City - the Vezel hybrid SUV. This compact SUV shares its platform with the Jazz and City and is powered by a 1.5 litre direct injection petrol and a battery. Power figures are not out now but expect more details to follow once the SUV is launched in Honda's home turf next month. In styling, the Vezel can easily be the best looking vehicle in its segment. With a big broad grille and a pair of aggressive headlights giving the front a purposeful look. From the side there is a play of lines that give the SUV its muscle, while the rear is neatly packed with a large taillight cluster. The overall package is sporty and the all black leather interior give the Vezel a luxurious feel. 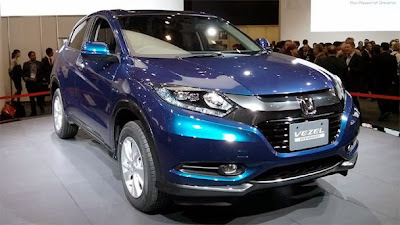 Though Honda has not confirmed it yet but there will be a non hybrid and diesel version of the Vezel in the near future that will come to India by 2015. Too long? Well, like we said - there is a new Honda City, Jazz and Mobilo coming your way soon.